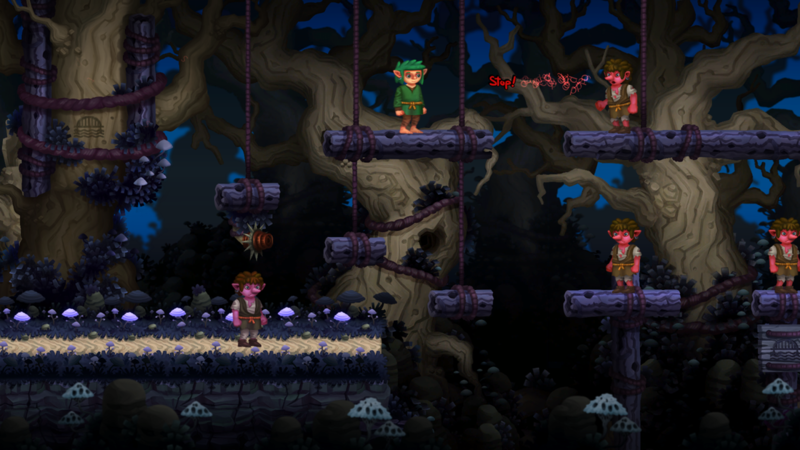 The Path of Motus is an indie platform-puzzler from Michael Arts that has players follow the life of Motus, a young goblin who wishes to be the first to leave his encaptivating forest that no one has escaped before. Despite his wishes, bullies will try to harm and stop him with their powerful words, and it is up to Motus to overcome these bullies one way or another. The Path of Motus’ gameplay is broken up into three major parts. It is one third a platformer with some “verbal combat”, one third critical thinking, and one third of a unique numbers game that was innovated from one of Michael Arts’ previously published titles, Pillar. When all three are meshed together, they make for a nice package of challenging puzzles that demand you take your time to think things over. One of the first things noticed about any gameplay from the game is its inclusion of platforming and “verbal” combat. Bullies will try to defeat you by saying things like “Hey!”, “Stop!”, “You!”, and “Nope”. Before these enemies attack, an icon above their head will display what button you need to press on your keyboard/controller in order to counteract their attack, which are U, H, and K. Afterwards, you can attack an enemy to defeat them using any button. The button layout is good on a controller, but on a keyboard, it feels a bit awkward. The button layout on a keyboard is interesting, as it tries to emulate a gamepad layout by using W A D and the U H K layout, but the combat feels a lot better with a controller. While not mandatory, it definitely improves the quality of gameplay. The platforming in The Path of Motus has a very unique approach, as it blends puzzle elements within the platforming. There are a few times where you really have to explore your surroundings and think outside the box in order to progress onwards. A few instances might seem impossible, but with enough experimentation and perseverance (which is in line with the themes of the game), you will figure out what to do next. There are some instances where you might need to time a jump just right, hit a button at an exact time, or execute a quick button combination to survive some enemies and a jump. There are a couple instances where precision jumping feels like it has to be perfect right down to the pixel. Despite this, it was easy to eventually find that sweet spot, but it would have been nicer to have a bit more leniency with some of the required jumps. One of the best parts of The Path of Motus’ gameplay are its number games. 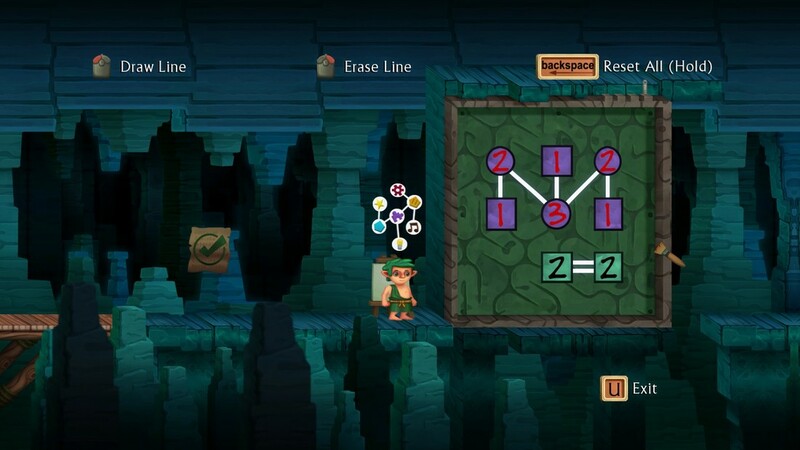 There are instances where Motus will need to create a bridge, or unlock a new pathway, and to do this, the player is taken into a numbers game of sorts. In this game, there are a bunch of nodes with numbers labeled on them. You can connect nodes to each other via lines, but you can only connect two lines between each node, and lines cannot intersect with each other. 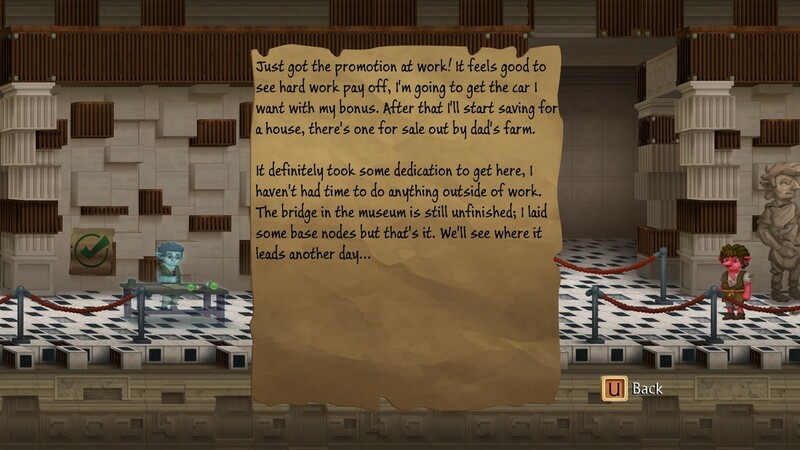 The objective of these games are to connect lines to a node that correspond with the value printed on them. While it might sounds daunting, it is a simple concept to grasp at first. These puzzle start of simple, introducing you to slightly more complex puzzles as you progress. 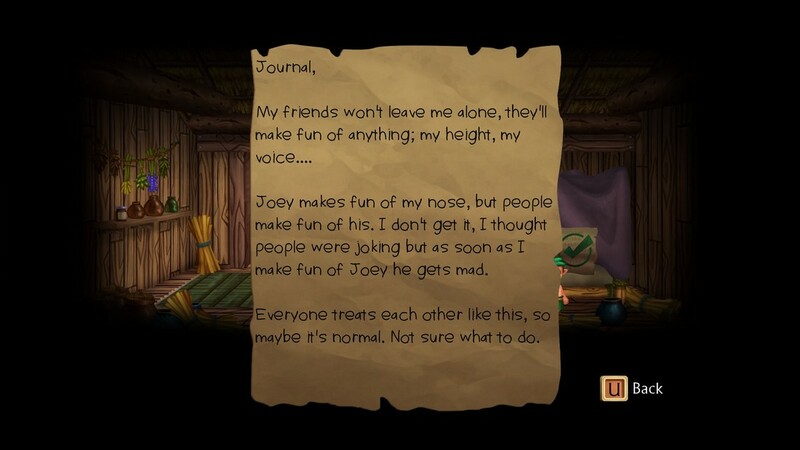 Once you reach the later stages of the game, this game becomes increasingly difficult, and it will require some serious thinking in order to figure out where you plot your lines next. There are a variety of different mechanics that are not outright explained, but they are intuitive enough that you are able to learn what these new mechanics are right away. This node-connecting puzzle concept has got to be one of the coolest puzzler ideas to come out of an indie game, and this is largely due to its excellent execution. Not only is the concept fresh and unique, but it is not explained in a hamfisted way, and it is easy to pick up and understand right away but difficult to master towards the end. There is also a new game + of sorts, but it is contextually reliant on the story and must be explained later. Right from the get-go, the first thing people will notice are the very indie looking graphics. While it might not seems appealing at first, it is endearing once you get used to it. They aren’t the flashiest graphics, but there is enough detail and charm to it that it does not come off as an eyesore. The level designs are really well done, especially in the later levels. There are a lot of interesting decisions that are made that add some extra flair to The Path of Motus. From the aesthetic designs of the levels to the presentation of challenges, everything just feels right. Even more so are the changing surroundings that reflect the story and how these obstacles are used to continue to drive the narrative home. The next thing to be noticed is the music. The songs that have lyrics, of course, have a heavy indie sound to it. One of these songs is the opening song to the game, and while it might come off as overwhelming at first, the acoustics and lyrics give off an alien, unknown mood, which is reflective of the journey the players are about to embark on. The songs within the game itself are nice as well and do their job nicely. There was only one time that I encountered a glitch, and it was a solution to one of the platforming parts. I feel like the solution I took was not intended to be a part of the original design, but that was one small part in a game that is practically free of technical errors. The way the game segments itself between its puzzles and story are actually quite nice, and it doesn’t break the flow of the game really. Once combat some enemies and do some platforming, you will have the option to travel into certain areas to get some nice bits of story. These sections usually consist of connecting nodes to build bridges or to unlock doors, and some are simple areas where you walk in freely to see what’s inside. These areas contain story from either Motus’ life, his relatives’ lives, or other peoples’ lives. I felt that it was a simple, but effective way to segment the game to highlight its different game mechanics. Speaking of game mechanics, one very nice touch with the verbal combat comes in the form of the attacks from enemies. In this game, as stated before, words can hurt you, literally, but Motus can defend himself with his own words. When enemies yell “Hey!”, it comes it comes through in a harsh, mocking tone, and when Motus fights back with the correct response, the “Hey!” sounds calm and genuine. It is almost as if Motus is trying to thwart the bully’s attempt at mocking through being nice. In addition, when bullies yell “Stop!”, Motus defends himself by saying “Why?”, and when bullies yell “You!” Motus responds with “Yeah”. These all feel like genuine responses that one would use to reverse teasing from a bully. Towards the end of the game, there is a new jumping mechanic that is introduced that helps Motus overcome seemingly impossible obstacles. The neat part about this design is that it can be performed at any point in the game, but the knowledge of how to do it remained hidden until a very key part of the game. This was a neat little way to add on another mechanic that opened up different paths to challenges. The story in The Path of Motus takes a lot of unexpected twists and turns. While you start off as a young boy of six, you quickly grow into adolescence, and then into adulthood. When you first play the game, you are introduced to the world, and while it is simple, it does a great job of setting up the tone and mood of the story. As a fair warning, there are some minor spoilers ahead. 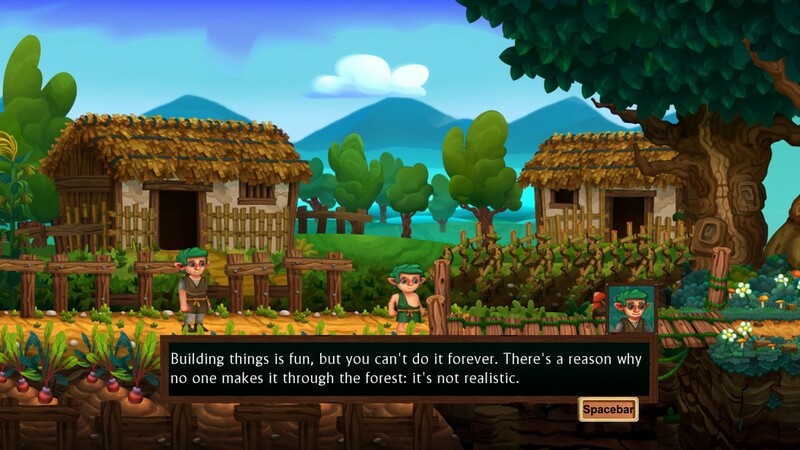 The story objective is to escape the forest where Motus and his people have resided their entire lives, and although many have tried to find a way out, none have succeeded. Motus wishes to succeed where everyone else has failed, and he does this by building bridges. When you first learn to make bridges by connected lines to nodes, Motus’ grandfather congratulates him, but Motus’ dad talks down to him, saying that he should learn to do farm worm instead in order to get ahead of the other goblin kids in life. This first scene is important because Motus will deal with bullies that also try to destroy his dreams of building bridges to escape his forest, but one of the first people to try and shoot down this idea is his own father, someone who should be the most supportive. As Motus travels through the forest, building more bridges, he will meet bullies that berate him, and he will meet one goblin in particular who will heckl Motus with a slew of classic insults that kids are known for. However, as you explore some of the areas and continue on with the story, you will realize that this goblin is confused, and is actually projecting his own insecurities onto Motus. While this is not the most subtle thing in the world, it does touch on the fact that sometimes bullies grow up in a confusing environment, and most of their harmful actions come from a place of insecurity. As you progress, you will find out that Motus feels like he has disappointed his father. He has spent all of this time building bridges to get out of the forest to the point where he has not focused on getting a “real job”, and he is continually berated for continuing to follow his dream. It is revealed that Motus’ father used to be in a band, and he was passionate about music. However, he ended up picking up a job at a factory that paid well, but it made him basically leave his music life behind. In the end, Motus’ father had a dream of becoming a full-time musician, but dropped that dream for a more stable job, and he ended up becoming complacent. As a result, he ended up with a failed dream, and he projects this on to Motus. It has such a nice, nuanced feel to it that it was extremely relatable in terms of chasing a dream that is unsupported by parental figures. As Motus continues to defeat enemies, the one reappearing goblin remarks that even though Motus is using his destructive words to get through the forest, he is still harming others in the process. As a result, he starts to turn into a much sadder looking goblin. As Motus moves from adolescence to adulthood, he will meet people who are unhappy with their life direction, people who continue to berate Motus for chasing an “impossible” dream, and the fear of failure. This harsh reality end up turning Motus into a withered looking goblin, and things really do start to look impossible. With perseverance, however, Motus does finally manage to make it out of the forest, and the ending is just on the other side. As you experience the game’s finale, you are treated with an ending that has an extremely personal touch to it that ties all of the game’s themes together. While it is ever so slightly cliche, it has a very real, human message to it that comes from a brave place. In the end, the game is about not giving up and pursuing your dreams, even if no one supports you in doing something that you love. Although the ending itself is a little lengthy, it is definitely worth the experience. And finally, players who complete the story the first time around are treated to the new game + mentioned earlier. Now that players have new mechanical knowledge of the game, they can basically retry some of the game’s obstacles by taking the high road and not hurting anyone throughout Motus’ journey. This added challenge results in a slightly different story that although does not add as much of a punch as the original ending, still ends up being worthwhile to play. 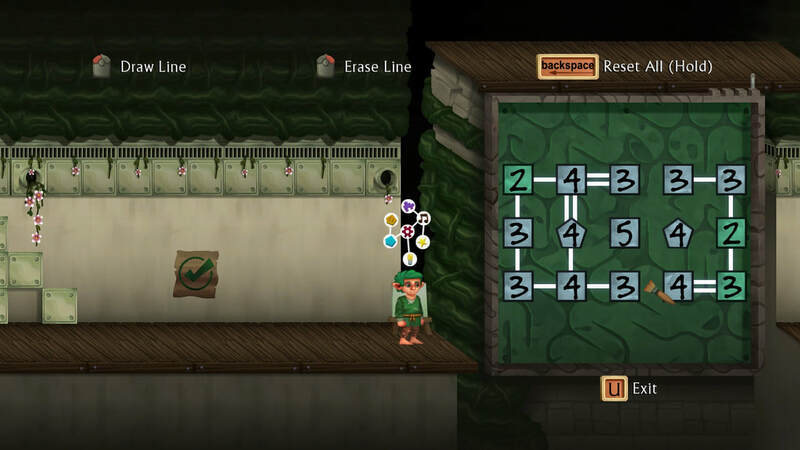 The Path of Motus delivers fresh and challenging puzzles that take some thinking from even the keenest of players. While the graphics and gameplay might not seem inviting at first first, they are actually highly endearing, and everything has a lot of heart and soul put into it, from the environments all the way to the game’s soundtrack. The narrative in this title is powerful, and while the overall story might come off as naive, it has a very real, personal touch to it that makes it emotional and thought provoking. As a result, the story of The Path of Motus has one of the most touching, relatable, meaningful meta-driven stories that I have ever experienced.